From 86 to 96 € the night I book ! 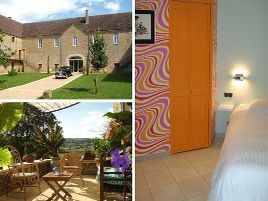 In Tournus, a dynamic and gastronomic town in Burgundy, this old, carefully renovated farmhouse sits within nearly 2 acres of grounds in the heart of rolling countryside. Nathalie and Philippe, collectors of old cars, wanted an interior without ostentation: simple yet good taste! The fantastic collection of old cars can be viewed in the exhibition hall. The three rooms each offer a different style, a voyage through different epochs, one of which can accommodate up to 5 people. As well as homemade sweet fare at breakfast, guests are also offered fresh farm eggs. The exhibition hall with its old cars and mythic Citroen DS's is the venue for this moment of conviviality. Warm and friendly welcome..
- pêche dans la Saône ou la Seille à 3 km. - golf de la Salle à 12,2 km. - Voie bleue à proximité. 3 rooms with shower and WC. 86 euros (1 pers. ), 96 euros (2 pers.). Extra bed 20 euros. 1 gîte with swimming pool also for rent. à 2 km de la N 6 et 3 km de l'autoroute A 6 sortie Tournus. The closest station is Tournus, located at 2 km. The closest airport is Lyon - Saint Exupéry, to 120 km.